Spring is the season of rebirth, and the landscape is turned into a nursery as baby birds hatch and baby animals are born. Usually nature does just fine, without any interference from people. But sometimes you find a baby bird, bunny, opossum, deer or some other animal alone in your yard. What should you do? According to The Humane Society of the United States, do not be too quick to do anything. Many parents leave their babies alone, sometimes for long periods. For example, mothers sometimes visit baby deer or rabbits only a few times a day, so that they do not draw predators to their young. Unless there is evidence that a predator has disturbed the area, you can probably watch and wait for the mom to come back. On the other hand, young raccoons are rarely left alone, so if you see a baby raccoon and don’t observe a parent for a while, it is probably orphaned. You can return uninjured baby birds to the nest; the parents will not reject them because of human touch. If the nest is destroyed or you cannot reach it, you can hang a woven basket, like you might get at a craft shop, near where the nest was, according to the Humane Society. If the animal is injured or if you have watched for a while and you believe the baby is an orphan, call your local humane society, animal control office or wildlife rehabilitator for help. 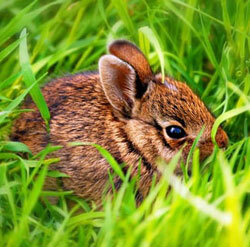 The Humane Society also urges you to be on the lookout for baby animals as you do your spring and summer yard work. Before you mow, for example, walk around your yard and check for turtles, rabbits, birds and other animals. If you find a nest, don’t mow over it, because you could kill or injure the babies. Just leave it where it is, so the mother can find it when she returns to feed the babies. Watch for nesting birds and animals in siding, in chimneys and in dryer vents. Try not to disturb nests until after the babies are old enough to be on their own.